Lavender Graduation is an annual commencement ceremony conducted at universities and more recently high schools to honor LGBTQ students and to acknowledge their lives and achievements. 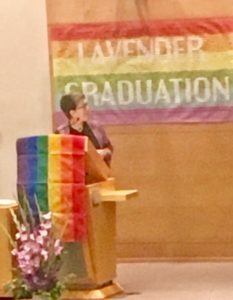 I created Lavender Graduation for two reasons: first, I wasn’t invited to my chidlren’s graduation becasue of my sexual orientation. Second, LGBTQ students were telling me that their lives were miserable on campus and they coudln’t wait to get out. I wanted their last taste of their college experience to be positive, to remind them that they and their scholarshi-p mattered to the academy. The first Lavender Graduation took place at the University of Michigan in 1995 with three graduates. Today, over 500 colleges and universities offer lavender graduation ceremonies for their students. In 2020, Lavender Graduation will be 25 years old. Invite me to speak at your school’s Lavender Graduation as we commemorate this milestone.